Living abroad we were a little unclear as the the purchasing process here in the US but Tim navigated us smoothly through this, and was very professional and knowledgable and most of all thorough. Despite the time differences between US vs Asia Tim was prompt with everything and the process was smooth, and we were well informed throughout. Tim's follow up has been awesome too-the sales been done and he's been paid but a year + later he's still helping us with recommendations on contractors, architects, and checking up on us once in a while to make sure the home's ok and our tenant well. Tim is thorough, responsible, and proactive. everything you'd want your real estate partner & agent to be. ​-Presidio Heights Buyers | Sabina & Jeremy S.
​-Haight Ashbury Buyer | Vanessa & Brandon C.
​-Daly City Buyers | David & Polly L.
4 years ago, Tim helped us purchase our first home as an investment property. We were new to the process and definitely needed guidance on how to navigate through the procedures. Needless to say, we needed to work with someone that looked out for our best interest. Tim was honest with his assessments on risk, detailed in educating us on the process, and always prompt in his response. During our investment period, Tim continued to check in with us to see how we're doing. When we had issues the property, he was still on point to help us with solutions. This really showed us that he valued us as clients for life. 4 years later, Tim helped us sell the property, and at the rate of 25% above our asking price! Once again, Tim has delivered excellent service, while helping us close a chapter in our investment. -West Oakland Buyers and then Sellers | George & Jeanne H.
It was a pleasure to work with Tim when it came down to selling my house. My journey started a year ago when Tim was selling another property in the same complex. He guided me through his strategy on selling that house and the costs involved in getting that house "to market". After my neighbor's house sold, he followed up to see what my time frame for selling would be ( nine months) and to show me the results of my neighbor's sale. Through out the process I never felt any pressure to list with him. Nine months later, Tim contacted me and he worked within my budget and time frame to get my house "open house ready". The house was staged, photographed, and listed within the time frame promised. In a cooling real estate environment, Tim was able to get a well qualified buyer to place a bid on our house and have the place close escrow in less than 30 days. I highly recommend Tim if you are thinking about selling a property in the SF Bay Area. ​-West Oakland Seller | Jimmy C.
I don't post much on Yelp. But, Tim deserves a buyer's review. We recently purchased a home in SF and used Tim Fong (based on his Yelp reviews). His approach and style is impeccable. Not only did he walk us through the entire home buying process, but he patiently listened and explained the real estate jargon in laymen's terms. I can't say enough great things about Tim. 5/5 stars!!! @Tim - Thanks for the post-home purchase follow ups! We love our new home! - Diamond Heights Buyer | Hansen C.
Tim was our real estate agent for our first purchase of a home. He made us feel comfortable and answered our questions with a quick turnaround time. He is very knowledgeable of the San Francisco neighborhoods. After the purchase, he was very extremely helpful getting settled in at our place by doing some of the work the previous homeowner did not do. Highly recommend to go with Tim. ​- Mission Terrace Buyer | Louis V.
This is a delayed but much deserved review. Tim was my agent and helped me buy a home in June 2010. He is knowledgeable, easy to talk to, and was extremely helpful throughout the home-buying process. He listened to what I was looking for in a home (in the Peninsula, single family, 3-4 bedrooms, price range, etc.) and showed me ones that fit what I wanted. There was no pressure, just constant communication and feedback until he brought me to the one that I wanted and ended up purchasing. To be honest, I don't remember too much of what happened afterwards.. the paperwork, appraisals, escrow, loan closing. I say this with the highest praise for Tim, because he managed the whole process seamlessly so that I didn't have to worry. He did all the work behind the scenes, and told me what I needed to know and do. Tim made buying my first home simple and easy. One thing I appreciate about Tim is that he makes you feel like a priority. Over the past few years since buying the house, I have reached out to Tim on numerous occasions with housing and rental questions. Each time, he has graciously spent the time to give detailed, informed and tailored responses to my questions. I would not hesitate to recommend Tim to my friends and am 100% confident that they will be satisfied with his service. Thank you Tim! - Serramonte, Daly City Buyer | Chris C.
Tim Fong ROCKS! Not only is he super professional & really knows his stuff, he is a super down to earth, honest & trustworthy person. Since I have worked with at least 100 other real estate agents in San Francisco over the past nearly 10 years, this speaks volumes! Because agents work for themselves & there are so many of them in the San Francisco Bay Area, they really have to hustle to keep business moving & constantly out perform the competition. What happens is that their clients will often see the "smooth-talking" realtor side that just wants to get the listing and will say whatever it takes to have a client sign with him/her. I share this because this is exactly what happened with my brother before he found Tim Fong to represent him and help him sell his San Francisco home. Other agents tried to sweet-talk my brother, giving him poor advice and when my brother finally signed with an 'un named' agent, he was surprised to be left high and dry when that agent deserted him. Tim saved the day with his relaxed and mellow personality, calming my brother after this traumatic experience. He came through with his straight-forward attitude, really taking the personal time with my brother and not putting on a "front", just helping him figure out what his options were and how to proceed with getting his home on the market. I've also watched Tim walk other clients through the home selling process, again with gentle guidance and never ever being pushy or overbearing. He's been a pleasure for me to work with and has always made my job SOOOO much easier, always going the extra mile, and being super accomodating and helpful when needed. 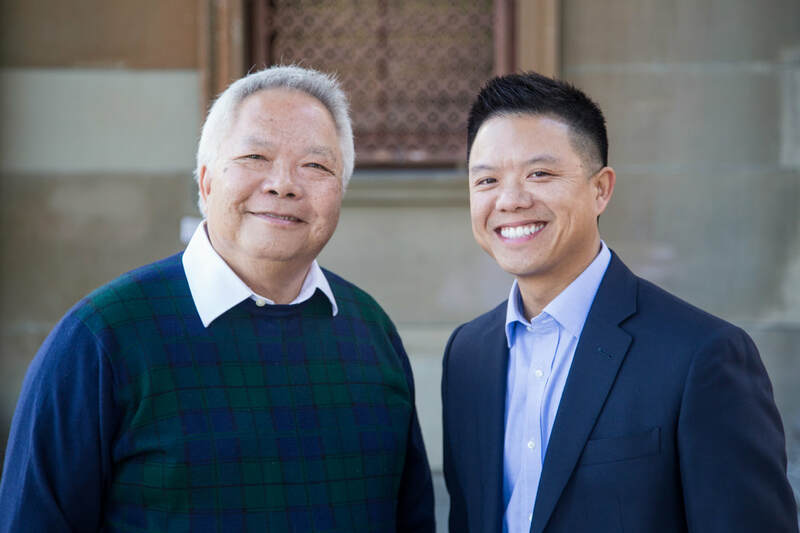 If you are looking for an easy going real estate agent who will honestly represent you, who is a REAL person, and not hiding behind some facade, TIM FONG is your man! He will get the job done and truly take care of you and your family. - San Francisco Stager/Designer | Erika L.
I loved working with Tim! He helped me and my fiance buy our first home in San Francisco. At our first meeting we went over what our dream home would look like and he was really honest about what types of homes we could find. He guided us through the whole process and was available any time we had questions. He was super patient with us especially since we were first time home buyers. Every time we met other realtors at open houses they would ask who our realtor was and the responses were always consistent: "You're in good hands!" I would recommend Tim to any future home owners out there. He made the whole process really enjoyable and easy. -Mission Terrace Buyer | Susan C.
Working with Tim was great. He helped us find an investment property in SF. He was by our side throughout the purchasing process and after 3 years, he's still by our side with anything we need. He's responsive, knowledgeable, patient and full of resources for anything property related. And trust me, you'll need all the resources when it comes to managing an investment property in the city. I've worked with quite a few agents, but have to say Tim's approach stands out from the others. He doesn't try to sugar coat things just to get the listing and is honest up front. Most agents will promise you the world, but can't deliver. I highly recommend Tim if you're looking for a great real estate agent! ​- Inner Sunset Investment Buyer | Jeffery L.
...Tim has the temperament you'd want in your real estate agent - calm, solutions-oriented and positive on top of being the best at his job! I give Tim my highest recommendation. If I could give him 7 stars I would. ...Tim and Peter had our complete confidence and the reason that we sealed the deal on our home in West Portal was because we felt that they always had our best interests in mind (sometimes a rarity in real estate - and this is coming from someone who works in the industry). They were also a joy to work with and two of the nicest people you could meet. ...When we first were introduced to Tim and Peter, I was in a hard rush to find an agent to list my property because my agent switched jobs on me without telling me 1 month before our was scheduled to go on the market. I was worried and generally angry at all agents for what I went through. They proved to be a god send. From day one, they were very frank and honest without the common agent mojo that I've been accustomed to. Peter is a plus because he comes with 40 plus years of experience in the bay area real estate market. They basically picked up my listing and guided me through the selling process to selling the property in a little over a month. Tim was very responsive whenever I needed him and is a text master at anytime. Incredible cause this guy has kids and a life, too. I was most impressed with how they handled our open house which only took one weekend to sell. We were on the market for 6 days and sold for 30% over asking with multiple offers. It was a modern day miracle. Go with these guys if you want to cut out all the real estate agent nonsense. -Crocker Amazon Sellers | Adam & Fanny L.
Pros: Super knowledgeable of the San Francisco/Bay Area real estate landscape, responsive, trustworthy and great at listening to what I wanted. I first met Tim when I was accompanying my friend to view an open house back in June 2015. I observed that Tim was knowledgeable about the property and pointed out the positives the property had to offer specific to what my friend wanted, but what really impressed be was that he also took time to highlight the cons on her no-no list. I appreciated this aspect about Tim and kept his contact information for when I was ready to take the plunge and purchase a place of my own. Several months passed with minimal contact with Tim. He respected my timeline and extended an offer chat with me about what I was looking for. From there, he put me on his MSL listing to give me ideas of what was out on the market in my price range. One day, I saw a property in Bay View on Red Fin and immediately got into contact with Tim. He was able to accompany me to view the property the following day. True to fashion, he pointed out the unit's pros and cons (based on what I wanted) and also the pros and cons of the neighborhood, showing how knowledgeable he was. I really liked the place and asked Tim how much he thought the unit would actually sell for. He gave me his estimate. Unfortunately, it was on the high end of my range and I went against his advice and went in with a lower offer. He went to work straight away, got me the disclosure package to review and highlighted his concerns. I moved forward and placed an offer on the unit. I did not get the place as the seller went with a higher bidder with no contingencies. (I later learned that the unit sold at the price Tim had predicted, yes he is that good). I was sad but not heart broken, so it only fueled me to forge on and continue my search. In the span of 2-3 months, Tim continued to send me listings, set up private viewing when necessary and accompanied me to about a dozen more open houses. Impressively, he knew also every selling agent of the units we viewed, he is one well connected agent! Through all this time, I never felt pressured by Tim to move forward with something I was not uncomfortable with. He always guided me through each offer I put in and highlighted items that were of concern in each disclosure package. At times, I got answers from him as late at midnight and early as 5am! Even with his busy schedule, I always felt like a priority client. Overall my experience with Tim and Coldwell Banker Residential Brokerage was very positive. Tim was able to find my little piece of SF to call my own and the best part was, that I got it for under the asking price! This was because of the many real estate connections that Tim and his father have in this industry. Even through the buying process, Tim continued to be patient, walked me through each step, answered all my first time home buying questions and even reminded me to follow up with my loan agent. Tim is truly a professional, trustworthy, patient real estate agent, so much so that I can now call him my friend! I immediately recommended him to my friends who were looking for a real estate agent, and he helped them to find their home in SF as well. I would highly continue to recommend Tim to anyone who is looking to purchase in the Bay Area. He is the real deal! - Excelsior Buyer | Kim D.
At an open house, Tim's colleague recommended Tim to me. Tim is friendly and easy to work with. He provided his recommendations for new home listings in the Bay Area and Peninsula. He is very patient and visited the homes that my family are interested in putting an offer. He examined and made sure if the interested home contained any red flags. He is diligent in responding to our emails and accommodates well to my busy work schedules. Even after getting the keys to my new home, he provided contractors that I can use for home maintenance. I recommend him for your home search. - Westlake, Daly City Buyer | Vincent N.